1. 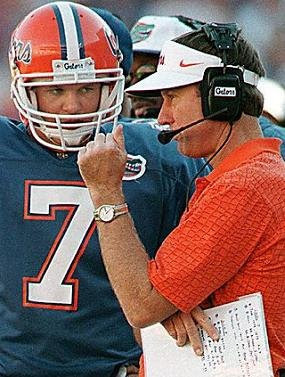 Bring back the old Spurrier: “I used to think I was pretty good coaching quarterbacks,” Spurrier said. 2. The Department of Sporting Jurisprudence: Do you have a right to be punished when you commit an intentional foul in basketball late in games? 3. Holy A-11 batman! The ACC now allows less than seven men on the A-11? Yes and no. As the good Doctor explains, they still can't have more than four players in the "backfield" (i.e. anyone not on the line) -- the idea is to prevent penalties when the offense has only ten men on the field. 4. Let me just go ahead and say no: I spent a substantial amount of time this offseason researching Michigan's offense (the results of which are to published, but not necessarily on the web -- though I hope to eventually get it out here or elsewhere that can be linked to). I will admit that I went into it thinking that there was some looming structural/strategic problem with Rodriguez's offense -- that's just my bent. Players win games obviously but I like blaming coaches more, and in any event all coaches have to work with what they have. But I quickly decided that, yes, there were things for Rodriguez to work on, but the biggest thing for Michigan was just to find a quarterback, any quarterback really. And, though he is but a wee true freshman, and a rather wispy one at that, Tate Forcier does appear positioned to at least be better for Michigan and Rodriguez than anyone they had last year. Threet said he has no indication what will happen in fall camp but figures the tipping point will be decision-making, which gives Sheridan a chance to play. "I feel like Tate has a good opportunity coming in early with the extra reps in the spring and that should be beneficial," he said. "But Nick does a good job of executing the offense the way they want it to be run. People may point out the physical things Tate or Denard may have at a physical advantage, but a lot of time at quarterback in this system comes down to decision-making." I can't seriously believe Sheridan executes the offense the way the coaches want it to be run . . .
. . . unless Threet means they've given that side of the ball a cigarette and a blindfold. Sheridan's decision-making last year was not a strong suit. . . . Why am I even spending time on this? The chances Sheridan takes a snap over a healthy Forcier are 0.001%. Seriously, people. I agree. Yet, Forcier could always get hurt, and what had been relegated to nightmares of 2008 could, Freddy Krueger-style, reenter the real world. (H/t mgoblog and Dr Saturday). 5. How much does passing predictability (i.e. the more likely it is that an offense will throw) affect the offense's success rates? Lots of wonky stuff at Advanced NFL stats, but the punchline: "Going from about 50% predictability to 90% predictability costs at least 1.0 Adj YPA." Read the whole thing. 6. Mike Leach interviewed by Bitter Lawyer. Breakdown: Law school had far fewer "gorgeous girls running around" than undergrad; although in law school he discussed contracts, they were "kind of like a Leprechaun. I had heard of them, but I hadn’t actually seen one"; he wants a 64 team playoff to replace the BCS, with the remaining teams playing in some kind of NIT substitute; and he actually comes across as rather normal in the whole piece. (H/t doubletnation). I think Sheridan could beat out Forcier. Sheridan was out all spring, and Forcier is only a freshman. Michigan will be terrible next year anyway. Not really a big sports fan, but is there another sport besides basketball where it is in your best interest to violate a rule of the game to gain an advantage at the most critical time of the game? maybe it's not exactly against the rules, but running out of bounds, kneeling the ball, intentionally causing a safety, and spiking the ball could be considered going against the main spirit of the game while giving the team an advantage. There's also intentional delay of game to get a better angle for kicks.